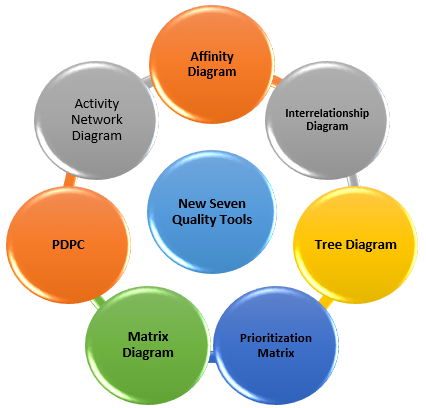 Seven new quality tools also called as seven management and planning (MP) tools are the tools developed by Union of Japanese Scientists and Engineers JUSE in 1976. Mostly they are based no operation research work done after second world war. These tools are meant to promote innovation, information communication and successful planning of major projects. It is also know as KJ method which was named after a Japanese anthropologist Jiro Kawakita. It is a kind of brain storming tool that organizes large amount of disorganized data and information into groupings based on their natural relationships. This diagram is useful where, there are many facts or ideas in apparent chaos and issues seem to be too large and complex. Similar to earlier cause and effect diagram this tool helps to analyze the natural links between different aspects of a complex situation. It is a systematic approach to breakdown broad categories into finer and finer details. This helps the thinking process to progress step by step from generalities to specifics. This diagram shows relationship between groupd of information about strength and role played by different indivisuals and measurements. This is a complex mathematical technique for analysis of matrices. This tool is often replaced by a similar but more rigorous decision making tool known as prioritization matrix. This diagram shows the tasks to be performed in their required order. It also gives best schedule for the entire project and potential scheduling and resource problems and their solutions. This chart systematically identifies what might go wrong in a plan under development.